Terri Lyne Carrington has reached legendary status by working as a side woman for greats including George Duke and Herbie Hancock, as well as leading the band on late night television programs hosted by Arsenio Hall and produced by Quincy Jones. Carrington went on to cement her legend by making a series of highly regarded albums that explored the history of jazz (Money Jungle: Provocative in Blue) or dug deeply into those areas where jazz merged with other forms of popular music on a series of recordings that stretch back to her Grammy nominated 1989 debut Real Life Story and includes the 2011 Grammy winning record The Mosaic Project. The latter project showcased the drummer as band leader and recruiter, as legendary female vocalists and musicians such as Esperanza Spalding, Cassandra Wilson Dee Dee Bridgewater and Sheila E responded to Carrington’s request to contribute their considerable talents to The Mosaic Project’s 14 tracks. 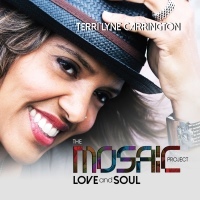 On The Mosaic Project: Love and Soul, Carrington returns to that format with a different set of original tunes and covers, and a new roster of women vocalists and musicians who are either refining legendary careers built over years of doing excellent work or are in the midst of crafting their own iconic careers. Check this lineup out: vocalists Lizz Wright, Natalie Cole, Chante Moore, Oleta Adams, Nancy Wilson, Chaka Kahn, Ledisi and Jaguar Wright, singer/songwriter Valerie Simpson, singer/songwriter and bassist Meshell Ndegoecello, bassist Linda Oh, saxophonist Tia Fuller, trumpeter Ingrid Jensen; keyboardists Geri Allen, Patrice Rushen and Rachel Z. The Mosaic Project: Love and Soul is clearly a project that showcases the talents of these female artists, but that only tells part of the story because the record includes remakes of tunes written by men who influenced Carrington such as Duke Ellington (“Come Sunday”), Bill Withers (“You Just Can’t Smile It Away”) and Luther Vandross (“For You To Love”). Actor Billy Dee Williams contributes several spoken word vignettes and a voice mail message from friend, collaborator and mentor the late George Duke, introduces the Carrington original “Best of the Best,” sung by Moore. That performance by Chante Moore on the mid-tempo “Best of the Best” is one of many highlights on this project. Vocally, Moore’s instrument has a depth and resonance that endows her performance with mature sensuality. Her phrasing makes the listener wonder if perhaps a jazz album might be in Moore’s future. Other highlights: The spark and sharpness that remains in Wilson’s vocal at 78-years-young. Carrington tapped Wilson to sing on “Imagine This,” a complex nu-soul/jazz hybrid and Wilson handles every single change in pace. Bringing in Valerie Simpson to lend her vocals to “Somebody Told a Lie,” a tune that she wrote with her late husband Nick Ashford, simply reveals Carrington as someone who has deep respect for those who have contributed much to the music. Don’t get it twisted because this is not an instance of charity because Simpson absolutely brings it vocally on a track that Carrington reimagines is a steamy and brassy ballad that features of Latin tinged percussive and piano interlude. Ellington’s “Come Sunday” is transformed into a work of up-beat of worship propelled by Carrington’s rapid fire drumming that it countered by Cole's energetic yet reverent caress of the lyrics. The convergence of funk and jazz on “I’m a Fool To Want You,” serves as a counterweight to Kahn’s torch singer jazz phrasing and turns the tune 180 degrees from the Ray Ellis’ definitive orchestral arrangement featured on Billie Holiday’s Lady in Satin album. But as good as the covers are on this record – and if you have to listen to on I’d actually choose Paula Cole achingly tender vocal work on the Withers’ song “You Just Can’t Smile It Away” – The Mosaic Project: Love and Soul stands as a showcase for Carrington’s talents as a songwriter, where tracks such as the folk/gospel/funk cut “This Too Will Pass” with Lalah Hathaway on lead vocals, the aforementioned “Best of the Best” and the ultra-smooth Get To Know You” are worthy representatives of the skill that Carrington brings to the game. Carrington had already ascended into the rarified status of legend and icon within the industry, and that explains why she was able to recruit an all-star cast to appear on this project. And the quality that listeners will hear on The Mosaic Project: Love and Soul pretty much ensures that the drummer will have no problems finding willing collaborators should she seek to make a part three. Highly Recommended.